The Following presentation of images and text are brought to you by Robert Oom and Kevin Musser, with a lot of help from Larry Wright. These images are from the Robert Oom Collection and are copyright in the same way as other material located on this site (for personal use only, without consent). The original color slides were taken by Charles Sincock, Rudy Maki and Bill Lohela on the dates shown. The slides were scanned using a slide scanner. Copper Range Baldwin S-12, #200. This photo was taken by Rudi Maki in the Houghton Yard, date unknown. Many thanks to Mr. Maki for allowing me to show a group of his great photos on this site. 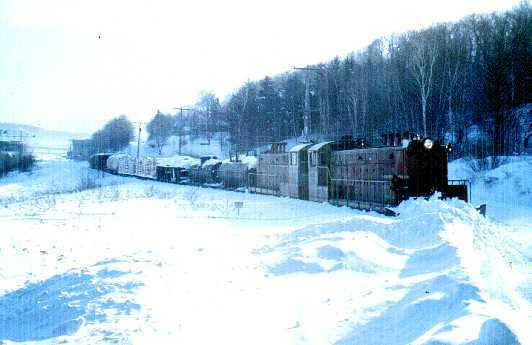 Keweenaw Central/Copper Range American C-2 class #29 and ex-Burlington green commuter Coach. 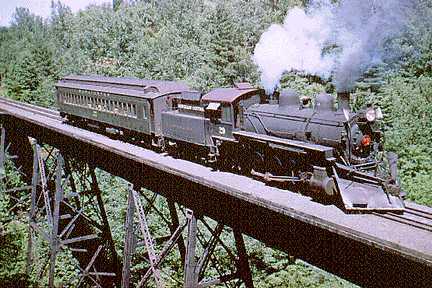 This beautiful photo captures an excursion crossing Bridge #30 over Hammell Creek near Lake Linden. 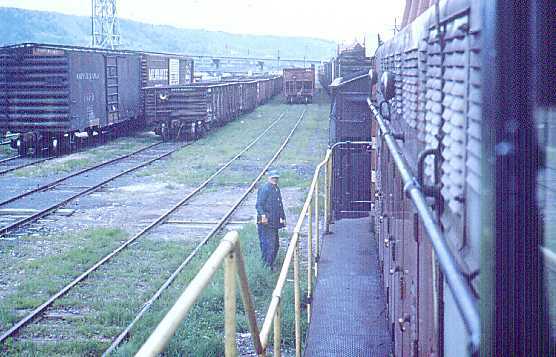 The photo was taken by Charles Sincock in August 1967 during the first year of operation of the Keweenaw Central tourist railroad. Only months after being refurbished by Clint Jones and his crew. 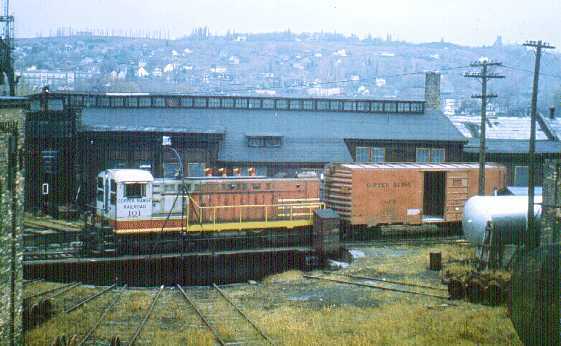 Copper Range Roundhouse and shops, This is a photo taken by Bill Lohela on May 10, 1974 and shows crews preparing to remove the steel turntable in the houghton yard. To really get a good contrast go here and look at a photo taken from the same place during the peak of operations on the Range. Copper Range Pushing Snow, This photo was taken by Charles Sincock on Feburary 11, 1971and shows crews pushing snow at Donken with the Russell plow. 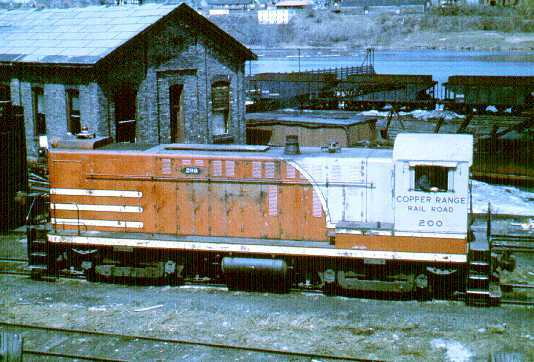 Bringing up the rear is COPR #605 (Ex- Green Bay & Western) which was a steel bay window caboose. Snow pushing days were almost over for the Range at the time of this photo. 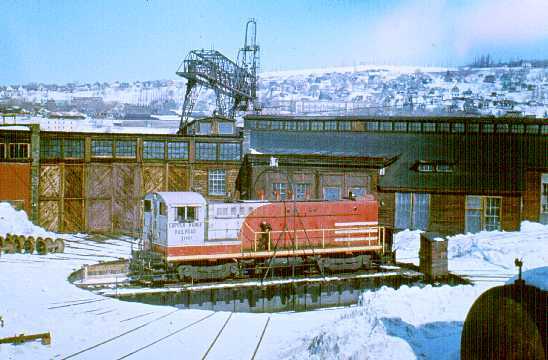 Copper Range freight in the Winter, This photo was taken by Charles Sincock on Feburary 8, 1972 and shows Copper Range #100 and #101 working together (MU-ed) to pull a freight south out of the Houghton yard. From here it is all up hill to Atlantic Mine. I'm staying on the snow theme as there doesn't seem to be much of it this year. Copper Range #29 get a new life. This photo was taken by Rudi Maki on May 26, 1967. 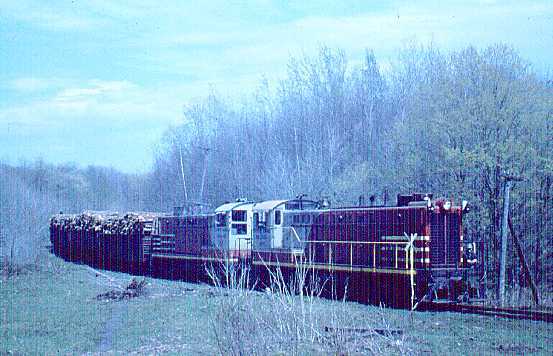 The photos shows the Clint Jones crew working to refurbish #29 for work on the Keweenaw Central tourist line. 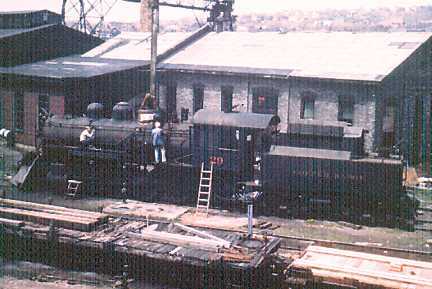 The work is being performed in the Houghton yard at the roundhouse. I heard a rumor that she might be headed to North Freedom, anyone want to verify this? That sure would be great, instead of just rotting in Ripley. The last run on the Copper Range. This photo was taken by Rudi Maki on October 27, 1972. 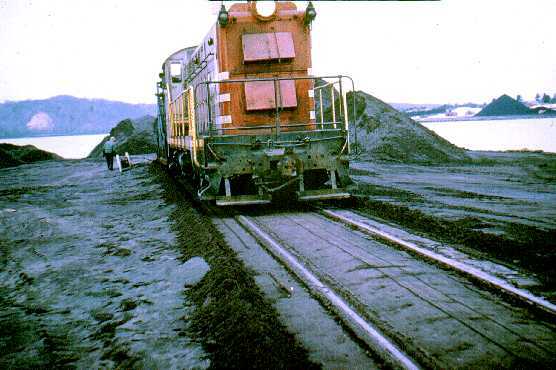 This date and photo are significant in the life of the Copper Range as this is a photo of the last train to run on the Range. 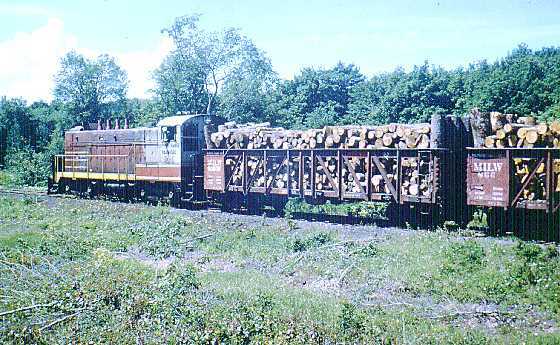 It was a load of wood up the line from McKeever. The photo was, of course, shot just as the train was entering the yard in Houghton. Milwaukee gons with pulpwood were cut down for gas line pipe loading from AO Smith, Milwaukee. The removed side panel sheets and floor sheets reduced the empty deadweight of the gons and prevented them from being diverted to other shippers. Photo was taken near Toivola with #101 at the head. Copper Range #100 in tow. This photo was taken by Rudi Maki on January 3, 1974. If you look very closely at the lower right hand corner you will see the tow chain being used to haul Copper Range #100 to the Soo Line Interchange after over a year of inactivity. 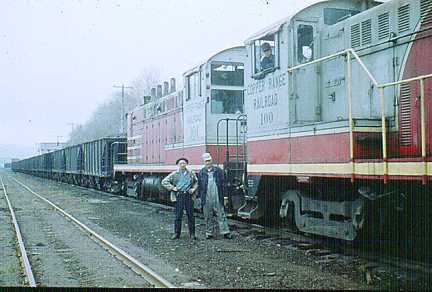 #100 was on its way to "new hope" and a new life on the New Hope and Ivyland Railroad. Russell snowplow in the Houghton yard. This photo was taken by Charles Sincock on April 16, 1965. 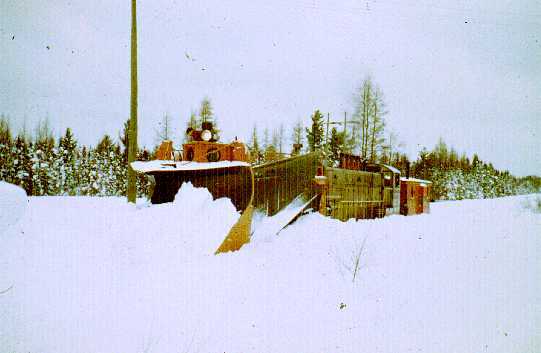 As the snows of '64-'65 begin to melt away the Copper Range's Russell snowplow may get to rest until next year, well probably not in the Keweenaw. Ralph Raffaelli related to me that riding in the snowplow and bucking the drifts was quite a ride. McKeever Freight. This photo was taken by Charles Sincock in June of 1963. 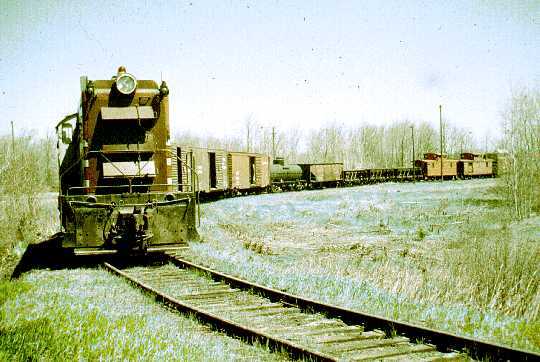 This train is a combination of the southbound freight to McKeever and loaded stamp sand cars destined for Freda, seen here near Mill Mine Junction. Houghton Yard. One This photo was taken by Charles Sincock on May 31, 1968. It is hard to imagine that on this very spot today stand a row of new homes. I would rather see the trains. Stamp sand for the Freda mill. 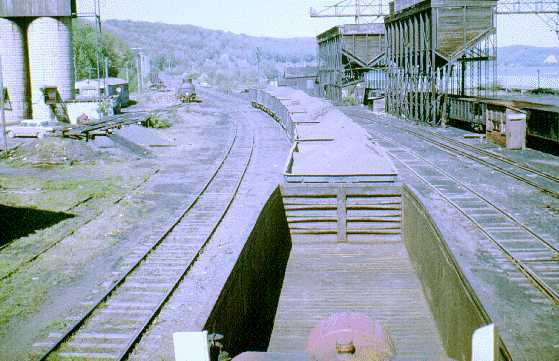 A good view of the west end of the Hoghton yard in this photo from the top of the diesel. 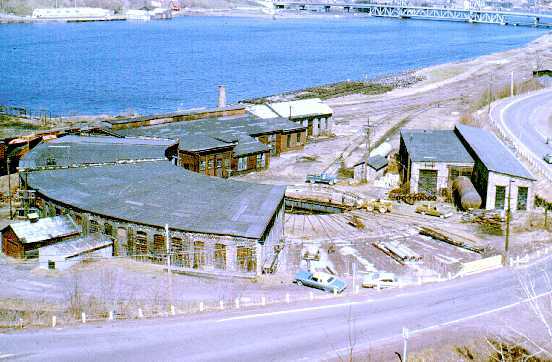 This photo, taken in June of 1963 by Charles Sincock, shows a string of rock cars full of stamp sand from the old Atlantic mill at Coles Creek. Waiting here for a time before moving to the mill in Freda. Copper Range #100. This photo was taken by Rudi Maki. No date is listed. Here we see Copper Range #100 taking a spin on the Houghton Turntable. Copper Range on the Atlantic Sands. This photo was taken by Charles Sincock during October of 1965. This photo shows the end of the spur the Copper Range built to reclaim the stamp sands from the first Atlantic mill on the Portage near Coles Creek. 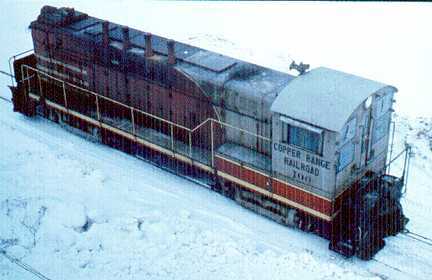 Copper Range pulp train. Rudi Maki left no date on this photo, but we do know that the Copper Range added MU capability to their Baldwin's in early 1964. 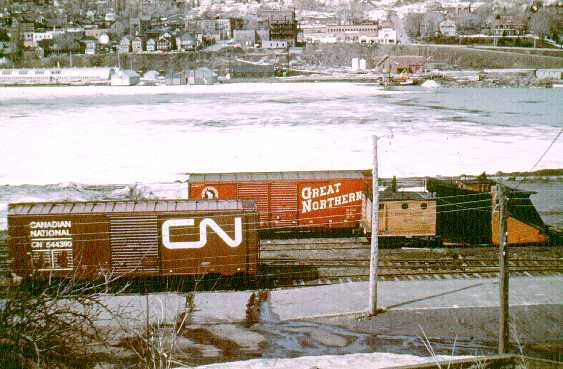 This pulp train was caught near Trimountain. 101 on the Houghton turntable. Taken by Rudi Maki during October of 1964 we see COPR #101 on the Houghton turntable, not sure why he is draging the COPR box car . 100 and 101 connected for multi-unit operation. 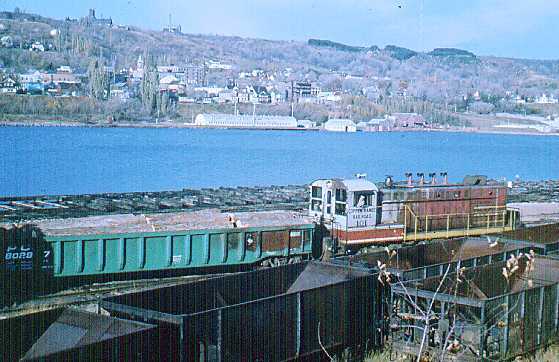 Captured by Charles Sincock in April 1964 this photos shows COPR #100 and #101 after being fitted with MU connections at the west end of the Houghton yard. #100 and CRRR employees say good-bye to coach #60. 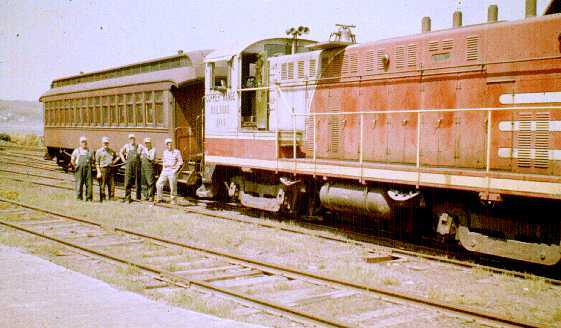 Captured by Charles Sincock in May 1964 this photos shows COPR #100 and coach #60. Although I can't be certain I would guess that Charlie took this photo to document the movement of #60 from the Copper Range to the LS&I's Marquette and Huron Mountain tourist line.